RMI's Expedition Skills Seminar - Emmons is a six day instructional mountaineering course with a summit attempt on Mt. Rainier via the Emmons Glacier route. 2 days of foundational skills training and 4 days of extensive practical training while climbing the largest glacier in the contiguous U.S.: Mt. 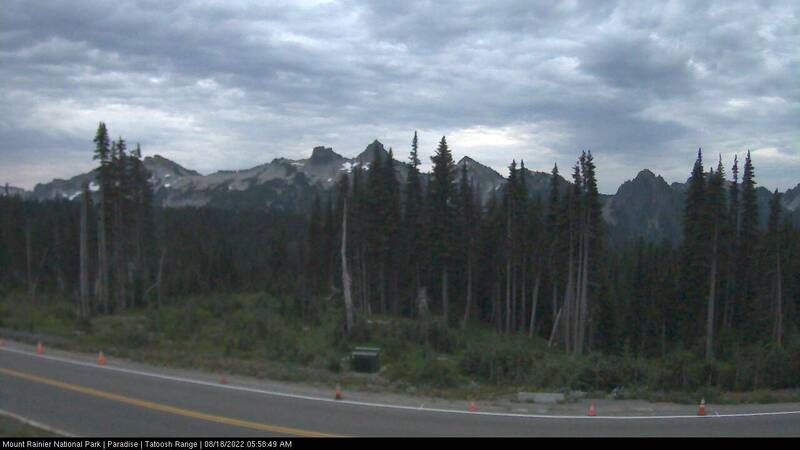 Rainier’s Emmons Glacier. An expedition-style climb allows us to establish successive tented camps as we ascend the mountain in preparation for our summit bid. Develop strong technical skills and gain foundational mountaineering experience. Our Expedition Skills Seminar on the Emmons route climbs a classic Mt. 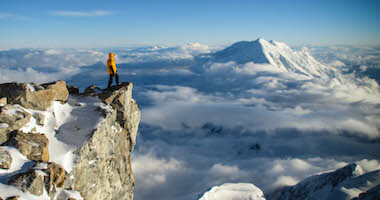 Rainier route with emphasis on developing mountaineering skills. After a Technical Training Day and a Mountaineering Day School, we ascend the Emmons route, using the mountain's terrain to learn mountaineering skills such as snow & ice anchors, crevasse rescue, ice climbing, fixed line travel, belaying and other technical skills, before making a summit attempt from our high camp at Camp Schurman. Utilizing a less traveled route on the northeastern side of Mt. 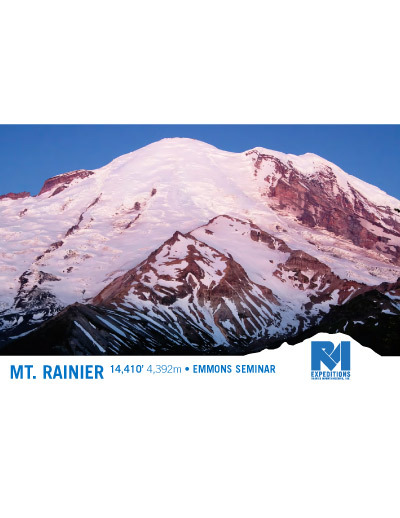 Rainier, our Expedition Skills Seminar – Emmons captures the best aspects of summer climbing on Mt. Rainier's far-flung glaciers. 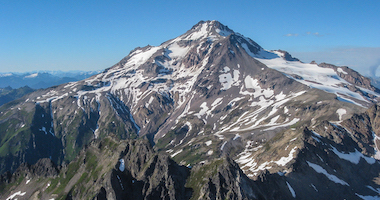 The Emmons Glacier route is truly an endurance climb, beginning on the forested Glacier Basin Trail and ending on the glacier-capped summit of Mt. Rainier. Our Expedition Skills Seminars are comprehensive training courses designed to educate climbers to the mountaineering skills needed to tackle the world's greatest peaks. Successful completion of the Expedition Skill Seminar - Emmons will make you eligible for many of our expeditions around the world, including Denali, and provides you with a foundation for other major glaciated mountains. I climb exclusively with RMI. I recommend them to everyone that will listen due to my two extremely amazing experiences. I feel like part of a team and not a customer when I'm climbing with RMI and I know I will be safe and that matters. Obviously the climb was the goal but what I enjoyed the most was the camaraderie we had as a team while we faced the challenge of the summit. 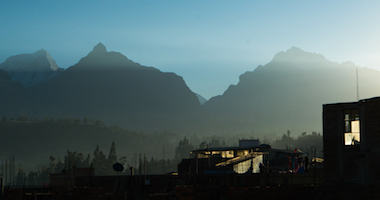 RMI just employs some of the best most motivating people to be guides. I had no idea what to expect and was still blown away by how much fun I had climbing with the team. I enjoyed learning about mountaineering and it was just so beautiful out there! Sherman was breathtaking, this was by far my favorite expedition. I will be recommending RMI to anyone and everyone who is looking for a guided trip. This Emmons Seminar provided me with all the tools I need to feel comfortable climbing Denali. I feel so comfortable with rope travel and anchors because we were actually able to implement many of the tools we learned on days 1 and 2, while on the glacier. I came off the mountain higher than life - and still feel that way! This experience was by far, the best experience and best week of my life! The course was comprehensive and enabled me to do more than just "summit". I learned life skills from knots, to camp skills, to leadership skills. Safety was never compromised and will continue to climb with RMI because of that. Honestly we had a great team. The guides were so positive and competent. We felt really lucky to have such a great team. We also had a great group of climbers. Again we felt really lucky to have such a great team of climbers and people to hang out with for 6 days!! The guides were all great. Learned a ton from them, and the overall experience was amazing. I really enjoyed the crevasse rescue exercises we did. Outstanding! I would recommended RMI to anyone and will not climb with anyone else. Is "everything" a cheat answer? I loved learning skills beyond what I thought I'd learn, met some really interesting folks who share similar passions, being outside all day, the climb, the exercise, the views, etc.. It was the Guides and the people on the climb with me. we all got along really well and it really made the trip for me. I have definitely made some new friends after this trip. I like that the guides on our seminar provided direction but did not hold people's hands. The course was set up in a way that prepared the group for more advanced objectives. Very rewarding, wonderful experience. It was a true privilege to be on that wonderful mountain with such a great bunch of people! I loved getting to experience real mountaineering. I had done other climbs in the cascades before, but none with roping up, ice axes, and heavy duty mountaineering boots/crampons. I liked getting to not only climb Rainier, but to learn a lot of invaluable stuff along the way. My experience with RMI was great. What stood out most was your team. It is obvious that RMI has a great company culture. Everyone I interacted with was friendly and helpful. I will definitely be back to climb Rainier again. Next time I do, it will be through RMI. I will use RMI again because of the experience I had with Mike, Jenny, Jessie and Ben. The guides, the team and the scenery. I learned alot about safe travel on emaciated terrain. The commitment to LNT and the privacy of the mountain was fantastic. I couldn't ask for a more peaceful time on the mountain. The overall experience was amazing. I think RMI is an exceptional company with the best guides! I really enjoyed the timeline for the trip. The expert training. Being new to Mountaineering this course was the perfect level of hands on detail to the many skills you need to be effective and safe going forward. Summit day and the feeling of accomplishment once we got to the summit of Mount Rainier. To be completely honest though, the entire trip was so great that the whole entire week itself was what I enjoyed most. The guides and the skills - I feel we got everything we were promised. Absolutely amazing. The entirety of the trip - from interaction with the office staff, to the itinerary and pace of the trip, to the people and guides on it - all stellar. I have recommended your company numerous times in the past and will continue to. The guides were awesome. The skills that I learned were by far the best part of the trip. The climb itself was a close second. The detailed instruction on climbing and safety. But nothing beat the actual trip to the summit. That is a memory I will never forget. I thought the guides were the best part of the trip. It's hard to have a great trip if you don't have guides who you click with. They made the trip. Learned a ton of skills and loved being on the mountain. Making such a challenging and sometimes painful experience, so much fun and exciting of an experience. Most of the comments in credit to Mike were what made this an amazing experience. Flawless. Learning about the characteristics of the mountain (weather, crevices, ice and rock fall) and how to navigate them safely was very fascinating and exciting. 1) Being on an amazing adventure with my sons. Learning from people that are passionate about what they do. The guides love the outdoors and it shows. Not only were the guides amazing but our group was as well. Even though we did not summit the knowledge and experience is unforgettable. The Emmons route was a far different experience than when I climbed the DC route with RMI 5 years ago. From the heavier pack to the longer approach through the forest, it was as if I was on a different mountain. I think overall I enjoyed the challenge of an expedition style approach and the lack of traffic on the route. Can't believe we had both the route and the summit pretty much to ourselves! The detailed discussions on mountaineering techniques, skills, and equipment. Thanks for sharing the knowledge. Learning the basic mountaineering and glacier travel skills from a group of guides that were all willing and enthusiastic about teaching and sharing their knowledge. The skills based learning was the best part. Certainly learned a lot that I will be able to apply toward future climbs. team comradery, guides sharing knowledge & experience, sense of adventure. What really made this trip for me was how much we learned. The guides shared so much information with us, and the real-life crevasse practice was also incredibly helpful. I also enjoyed interacting with the guides; it would have been a very different trip if we hadn't had such friendly guides. I really enjoyed and thought highly of our guides. They were all very competent, which I expected. But, I genuinely enjoyed spending 6 days with them. They shared lots of knowledge and created an appropriately fun and light atmosphere. Just the overall challenge, pushing ourselves through some beautiful country. I could not place one thing per se, but it was a collection. While I was not super excited about doing the crevasse rescue when we had a long climb down yet on the final day it actually was really cool and I am glad they had everyone take turns at every position. That sort of hands on style and accountability forces me to learn things much better. The guides were what made this trip amazing. I can't say enough good things about them! I liked the small group environment and the guide to guest ratio. I found the crevasse rescue training very valuable. The people (the other clients), the process (itinerary), the learning (the skills seminar), the time spent in the mountains with true professionals (the guides), and the folks that made it happen (the RMI staff). You guys did a great job in planning great weather for our summit day :). Not too cold, not too hot. Just kidding, the experience on the mountain was incredible. The pace was great. The skills seminars were great. The whole experience was so seamless, hard to call out one thing I enjoyed the most. I guess summit day was a great challenge and experience and the views were other worldly. The scenery was obviously incredible. I was extremely impressed with the guides' ability to instruct, lead, and really just manage climbers, like myself, with very little experience with the apparent ease and enthusiasm they did. It made for a very enjoyable experience. Meeting people with similar ideas of fun. I really enjoyed the seminar format. We had time to really get to know our teammates and guides and take our time getting from camp to camp. I also enjoyed learning rescue techniques and having the chance to ice climb in a crevasse... while still achieving our ultimate goal of summiting. RMI did an excellent job. The trip was very enjoyable, the guides were great and I will definitely consider future trips with RMI. Friendly staff and beautiful mountain! This is what climbing is all about! Interaction with amazing guides. Learning. The guides were so cool, it just made the trip so fun. Also, the summit was cool. The 4 guys worked so good together and their humor was perfect. Encouragement when climbing, and humor and good stories when relaxing. the guides. They were all amazing. The leave no trace behind tactics being practiced on the mountain has left the mountain very well preserved. It's a beautiful place. Great experience, wonderful and knowledgeable guides. Memories that will last a lifetime. The cohesiveness of the group and the opportunity to climb with experienced and knowledgeable guides was the best part of the trip, no doubt. The guides on this trip we're fantastic. The weather conditions made for great success. Having done the DC last year really provided a good foundation for this year's seminar in terms of expectations for physical demands and further developing technical skills. Learning from the guides. They have so much combined knowledge and were more than happy to freely give it. The main purpose of this trip for me was to learn the skills to apply to my independent mountaineering ambitions. I got way more information than I was expecting and couldn't be happier with the way it was delivered. I LOVED this trip!!! Probably the biggest factor in our overall success was the highly positive and upbeat tone that Pete and the guide team set from the very beginning. They got along incredibly well, kept things interesting and fun, laughed and smiled a lot and treated everyone with respect. Also they seemed very relaxed, never rushed and projected confidence that we all picked up on. As a result, our group got along very well, learned A TON, and ended up helping each other for the good of the team. Except for some soft snow encountered on our descent on summit day, we could not have had better conditions for our climb. The weather and the mountain were just about perfect for us.I was a little surprised that after having made it down from the summit and then taking a few hours rest, Pete roused us out for crevasse training! (I thought we should be taking the rest of the day off!) However, crevasse rescue turned out to be my very best experience for the entire trip! I loved going down in the crevasse and having 10-15 minutes to look down inside as my team was preparing to haul me out. I had no idea how deep, how big and how beautiful and spectacular a seemingly "minor" crevasse could be. I came away with an entirely new respect for crevasses and the importance of avoiding any falls near them. Back on the top side, I thoroughly enjoyed learning anchor, rope and pulley techniques from Mike. When it was time for me to lead, he always was there encouraging me, projecting incredible confidence and coaching in a very calm manner. I learned a lot and never had any doubts that we would succeed. What a great experience! It's hard to beat being on the mountain and looking out over the landscape...or down into it when I was doing crevace rescue. As far as RMI goes, I thought your guides were the best part hands down. You've hired good people in Pete, Mike, Bridget and Billy. The people and guides! I really enjoyed our group, we had a fantastic group! I loved the route and wish we could have completed it. Climbing on ropes, camping, climbing with a group. I most enjoyed interfacing with guides and other clients. Learning their backgrounds and skill sets. The summit was, of course, enjoyable, but I will always remember the people who got me there. I really enjoyed the professionalism and down to earth attitudes of the guides. Walter and Katie were solid leaders during the training days and during the climb. Bridget and Chase provided great support during the climb and also had great attitudes, giving advice and sharing personal knowledge to help everyone become better climbers. I really enjoyed the entire trip. The guides were fun, professional, and knowledgeable, and I felt safe with them the entire time. The entire trip from booking to enjoying my beer at base camp. Whitaker bunkhouse was terrific, the rental shop was more than helpful. And of course the guides where all great. I enjoyed everything about this trip. Summiting was an especially moving experience for me for a variety of reasons, but simply spending time on the mountain and meeting a group of fantastic, fascinating people was wonderful. 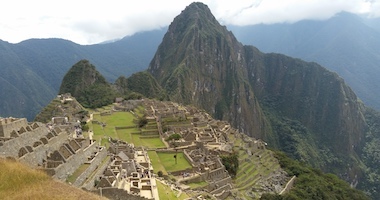 The guides were exceptional, and the experience was unforgettable. Can't wait for my next climb with RMI. The comraderie and bonds that formed between our team and our guides. Most of us were strangers before we met at base camp, but the friendships that were established on the peak will far outlast this one climb. We already have our next trip scheduled, and many of us will be climbing together again. I'd love to climb with any of the guides again as well, and plan to look them up as I plan my future climbs. Just being on the mountain, taking it all in. the information, the desolation, the mountain, the people, the experience. It's a lot to process sometimes. the great learning. the interactions with the guides and other climbers. a great experience. best mountain experience that i have had so far. I couldnt have hoped to learn as much as I did from the guides throughout the seminar-summit trip. Encouragement from the guides, who could see that I could make the summit when I couldnt see it myself was so great. RMI offers such a great trip and I will be using RMI again next season. The guides were always attentive and provided a professional and rewarding experience. I will use RMI again because of this. I'm being generous with the rating, but I am giving it an average because of my respect for what the guides do. Personally, it was a "poor" experience compared to my other RMI experiences. 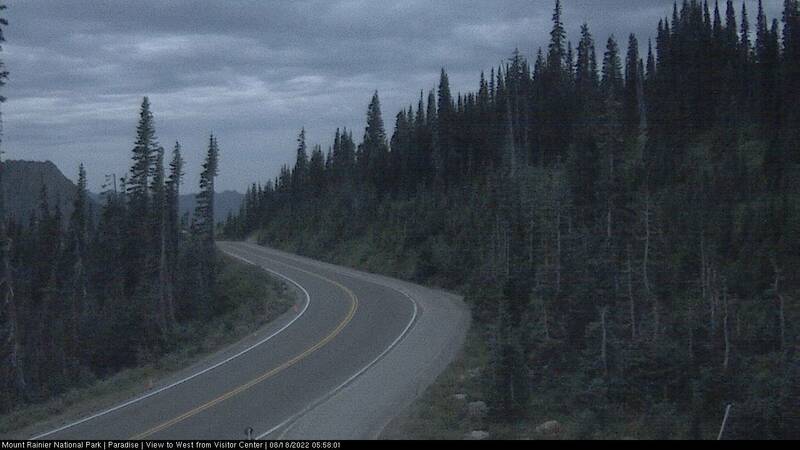 The location - seeing Mount Rainier and the National Park. Being challenged mentally and physically. Hanging out at the RMI Base Camp with other mountaineers. Ice Cream at the bunk house. Buying new gear. Learning about and experiencing the functionality of gear and clothing. Learning mountaineering skills and camping. Appreciating nature. The skills like crevasse rescue, ice climbing, rope walking, etc. I really get a kick out of mountaineering. I love being up on the glaciers and going high and having to learn new skills. I particularly enjoy the challenge. Committing to this sport at my age is in many ways life changing. It forces me to set long term diet and physcal fitness goals in a way that I have never experienced before. I think of myself as pretty fit and I lead an active (semi-retired) lifestyle - I hike in the mountains around Sun Valley, ID, I ski there 45 days a year, I play lots of golf and walk (I eschew electric carts), I bike, I fly fish in trout streams (rocky bottoms in current is great for balance) and I love being outside in nature and in the mountains. This sort of adventure simply elevates all of the challenges - I truly understand that to do this you have to be really fit. I understand that there is lots to learn to climb in the mountains safely. I understand that there are objective dangers and that there are conditions and situations beyond our control that may affect whether or not a climb will result in a summit attained. But I have learned that the journey is as much fun and the summit. And by journey, I mean reading about mountaineering, working out to stay fit and building up to the experience. My only regret is that I did not start doing this until I was 61. Thanks to RMI for creating this terrific set of experiences and for making it as safe as possible. Learning the skills i need from people that really know their stuff. Being on the mountain with good company! Learning the mountaineering skills by the instructors; knots, crevasse rescue, ice climbing, and glisadding. Everything was great but if I had to pick one I would say the guides are great. It is obvious that RMI makes a great effort to put the best guides in the industry on their team on on the mountain. I hope to keep in touch with everyone of them and get the opportunity to climb with them soon! 8:00 - 6:00 p.m.: Meet at 8:00 a.m. at Rainier BaseCamp in Ashford, WA. Please dress casually and bring your climbing equipment and clothing. 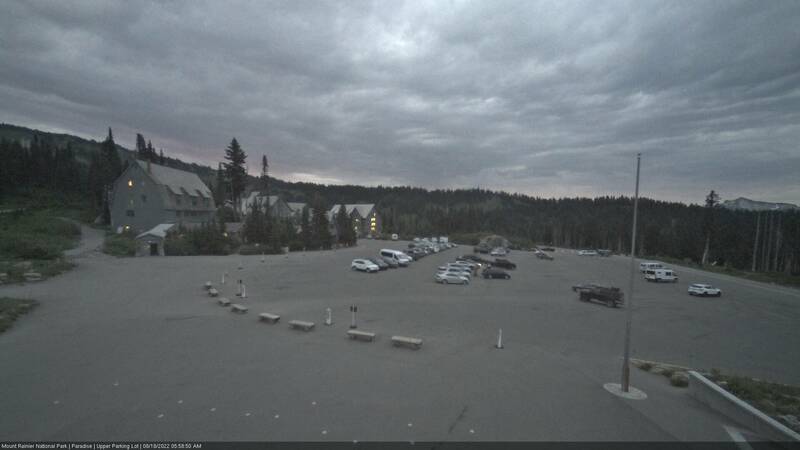 8:15 a.m. - 5:00 p.m.: Meet at 8:15 a.m. at Rainier BaseCamp. Please arrive dressed for hiking, packed with your Mountaineering Day School gear. After a team meeting a shuttle takes our group to Paradise. The Mountaineering Day School is spent training in the field on the lower slopes of Mt. Rainier. Climbers are introduced to many skills, from the basic techniques of efficient mountain travel (rest-stepping and pressure breathing), to various safety practices including use of helmets, harnesses, and avalanche transceivers, cramponing, roped travel, ice axe arrest practice, anchors and running belays, fixed line travel, and the basics of crevasse rescue. Over the next four days we ascend the mountain in an expedition style climb, establishing multiple camps to set ourselves up for our summit bid. During this time the group will learn and practice various mountaineering skills such as crevasse rescue, anchor placement, ice climbing, fixed line travel, and self rescue techniques among many others. Evening lectures in camp include discussion on mountain weather, medicine for mountaineering, altitude wellness, equipment and any requested topics that spark your interest. 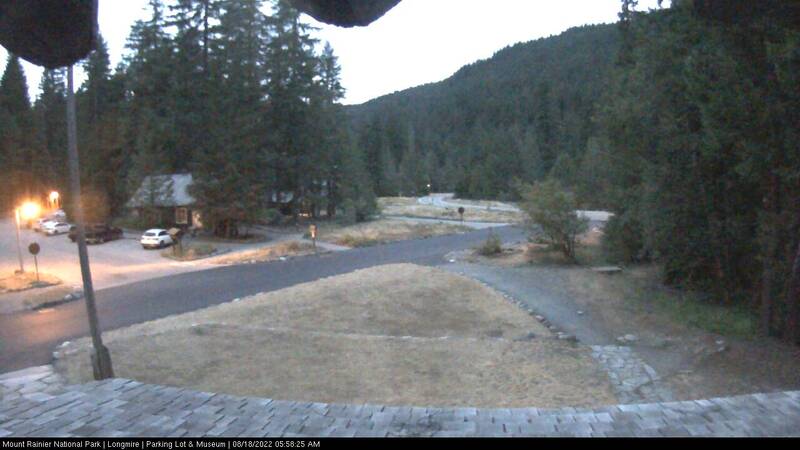 Meet at 6:00 a.m. at Rainier BaseCamp. After an early team meeting a shuttle takes our group to the trailhead at the White River Campground (4,400'). We make the 3.3 mile hike, passing through beautiful mature forests, to Glacier Basin, or ascend a bit further to the base of Mt. Rainier's Inter Glacier, to establish camp. As we move towards camp, we work on the foundational skills that make us more efficient and capable climbers, including pressure breathing and using the rest step, dressing appropriately for the weather and workload, kicking steps and climbing in balance on snow, and efficient pacing that allows us to climb comfortably. 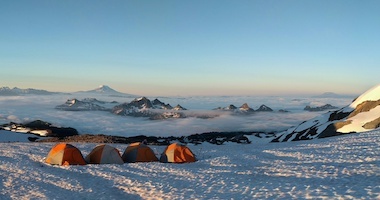 We ascend the Inter Glacier and climb over the flanks of Steamboat Prow onto the heavily crevassed Emmons Glacier as we move to our high camp, Camp Schurman, 9,440'. At Camp Schurman, we have a great arena to practice additional skills, such as proper placement of snow and ice anchors, crevasse rescue simulations, and ice climbing. In the afternoon we prepare for the summit bid. Today we put it all together and make our attempt on the summit. The Emmons-Winthrop Glacier route climbs the northern edge of the largest glacier in the lower 48 states, the Emmons Glacier. The spectacular 35-degree central ramp of the glacier offers a route by which we access the crevassed slopes of the upper mountain. We thread our way through these immense crevasses toward the summit of Mt. Rainier! After reaching the summit, we descend back to Camp Schurman. The descent typically requires half the amount of time of the ascent but requires significant effort as we retrace our route down the mountain. 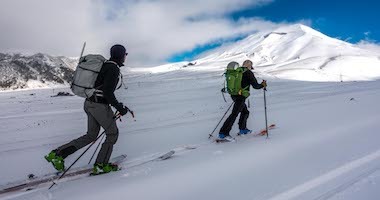 The duration of the climb depends on many variables including snow conditions, the time of the year, the route conditions, the weather, and temperature among others. It is a long and challenging, but rewarding day! 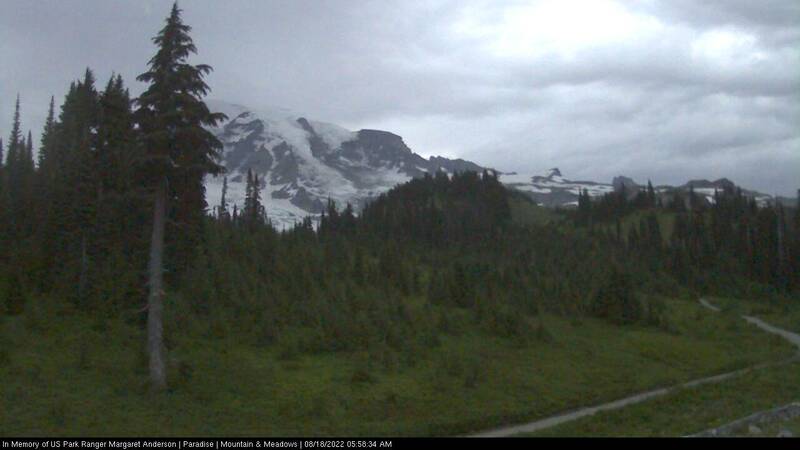 On the final day of the program we descend to the trailhead and return to Rainier BaseCamp in Ashford. After all the gear is unpacked, we gather as a team to celebrate our adventure. On the Expedition Skills Seminar - Emmons you will need 5 mountain lunches, 3 dinners, and 3 breakfasts while on the mountain. Our climber-to-guide ratio is 2:1 on the Emmons Glacier route.